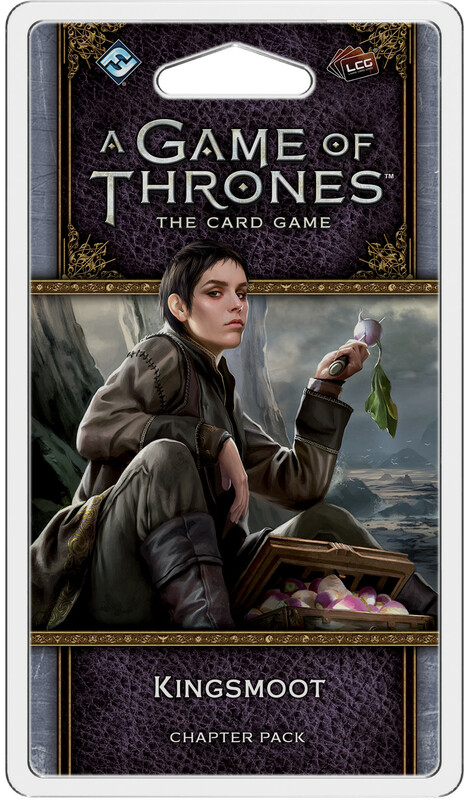 In the tradition of the other Chapter Packs of the “Flight of Crows” cycle, Kingsmoot contains sixty new cards, offering brand-new characters, locations, attachments, and events for the eight factions of A Game of Thrones: The Card Game. As the story of the cycle continues to follow A Feast for Crows, you’ll see characters like Ramsay Snow, Raff the Sweetling, Jhiqui, and Darkstar entering the game, alongside two new neutral Brotherhood characters. As the bestow keyword gains strength, other cards reward you for forging alliances between factions — but no matter who you fight for, you’ll find the cards you need at the Kingsmoot!